1 Toast the bread very lightly to firm it up. 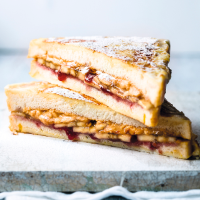 Make 2 sandwiches, spreading each with peanut butter, topping with the banana and finishing with 1 tbsp jam. Press at the edges to seal in the filling, then put the sandwiches in a small, deep baking dish. 2 Beat the eggs, milk and sugar together with a pinch of salt, then pour over the sandwiches. Set aside for 20 minutes (or up to 3 hours in the fridge), turning carefully after 10 minutes. 3 Heat the butter in a frying pan until foaming. Lift the sandwiches from the egg mixture and fry over a medium heat for 2-3 minutes on each side, until golden; dust with icing sugar as you turn them. Halve and dust with more icing sugar, if liked.